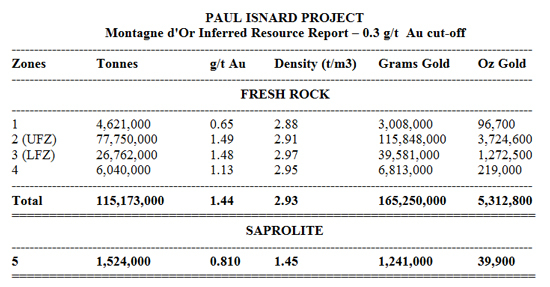 The Montagne d'Or deposit as delineated to date begins at surface and reaches an average vertical depth of 247 metres from surface. Utilizing a cut-off grade of 0.3 g/t gold yields 117.1 million tonnes at an average grade of 1.43 g/t gold for a total of 5.37 million contained Inferred ounces of gold. For comparison, a significantly higher cut-off grade of 1.0 g/t gold would still yield 58.1 million tonnes at an average grade of 2.22 g/t gold for a total of 4.15 million contained Inferred ounces of gold. See table below for various cut-offs provided. Robert Giustra, CEO and Chairman of Columbus Gold, commented: "Phase I drilling has clearly demonstrated that the Montagne d'Or gold deposit has both large scale and good grade. Modelling by Coffey has also identified gaps within the deposit envelope where additional drilling has the potential to add ounces and where tighter drilling may upgrade some or all of the Inferred resources to the Indicated category. Additional expansion potential is also suggested by untested geochemical anomalies extending more than three kilometres along strike, by incompletely tested parallel zones of gold mineralization, and at depth. The deposit has potential to grow." The current modelling and updated mineral resource estimate were prepared by independent consultants Coffey in accordance with National Instrument 43-101 Standards of Disclosure for Mineral Projects ("NI 43-101"). Coffey's work utilised largely the same parameters as the pre-Phase I drilling resource estimate of 1.89 million ounces gold Inferred conducted by independent consultants SRK Consulting ("SRK") in February 2012, with the exception of the cut-off and top-cut grades, for which Coffey used 0.3 g/t and 16 g/t gold versus the 0.4 g/t and 30 g/t gold used by SRK; for comparison purposes, however, the table below also includes a 0.4 g/t cut-off. *Rounding may generate minor differences in tonnage, grade and contained ounces of gold reported in the above tables. According to National Instrument 43-101 and CIM (2010) an "Inferred Mineral Resource" is that part of a Mineral Resource for which quantity and grade or quality can be estimated on the basis of geological evidence and limited sampling and reasonably assumed, but not verified geological and grade continuity. The estimate is based on limited information and sampling gathered through appropriate techniques from locations such as outcrops, trenches, workings and drill holes. Due to the uncertainty that may be attached to Inferred Mineral Resources, it cannot be assumed that all or any part of an Inferred Mineral Resource will be upgraded to an Indicated or Measured Mineral Resource as a result of continued exploration. Confidence in the estimate is insufficient to allow the meaningful application of technical and economic parameters or to enable an evaluation of economic viability worthy of public disclosure. will also cover a prominent IP geophysical anomaly identified parallel to and 500 meters to the south of the Montagne d'Or deposit. The Paul Isnard project is located in NW French Guiana 180 km west of the capital, Cayenne, and 80 km south of the department capital, Saint-Laurent-du-Maroni. The project is comprised of eight (8) mining concessions and a pending application for an exclusive exploitation permit (PEX) covering an area of 149 km2. The project is accessible via an all season forest road from the town of Saint-Laurent-du-Maroni, for a distance of 120 km, and by small aircraft to the project's base camp. Several roads crisscross the mining concessions providing truck access. Most of the Paul Isnard concession area, including the Montagne d'Or deposit, lies within the "Area in which Open Pit Mining Activity is Authorized" under the new mining legislation (SDOM) that went into effect on January 1st, 2012. Conditions embracing large scale mining include a viable mineral deposit, completion of an Environmental Impact Study and Reclamation Plan, and additional reclamation, or environmental investigations as may be required. The Paul Isnard Project occurs within the Guiana Gold Belt which stretches from western Venezuela eastward through Guyana, Surinam and French Guiana and into Brazil. Mineral deposits are typical of those in other greenstone terrains such as in Canada, Australia and West Africa. Many significant gold deposits and prospects have been identified on the Guiana Gold Belt, including Las Cristinas >32 Moz, Choco 10 >7 Moz, Toropoaru >9 Moz, Aurora >6.7 Moz, Omai >4 Moz, Gros Rosebel >4 Moz, Merian >3 Moz and Camp Caiman >4 Moz. Numerous other prospects, mostly in Guyana and Surinam are undergoing active exploration. At Montagne d'Or, the gold mineralisation is hosted within a 400 m thick sequence of intercalated felsic and mafic volcanic and subordinate volcaniclastic rocks that strike east-west and dip steeply south. The near surface gold resources are contained within four (4) closely-spaced stratiform, sub-parallel, east-west-striking and south-dipping sulphide mineralised horizons, which include the principal UFZ and LFZ having average thicknesses of 50 m and 17.5 m, respectively. Gold mineralisation is associated with disseminated and stringer sulphides with occasional semi-massive seams to several cm in width, mainly as pyrite, and is accompanied by pervasive alteration, which includes sericite, secondary biotite (retrograded to chlorite) and secondary K-feldspar ± quartz. Only a small portion of the deposit has been subjected to upper level oxidation. The mineral resource estimate was prepared by Coffey Mining in compliance with CIM Definition Standards (2010). The estimation is based on 56 historic drill holes, included as part of previous resource estimates, together with the results of 45 diamond drill holes completed by Columbus Gold from late 2011 to August 2012 (Phase I). The digital drill hole database includes 26,280 samples and 25,221 gold assay results. No channel samples were included in the database or used in the interpretation because of the difference in the sample support. Drill hole spacing in the central part of the deposit varies between about 35 m to 75 m and 100 m to 200 m on the extremities. The mineral resource estimation were prepared from a geostatistical block modelling method based on the drill hole data. The mineral resource model is constrained by an interpreted geological and structural boundary of the gold mineralisation constructed as a 3D wireframe interpreted from sectional drilling and assay data. The wireframe conforms to the interpreted four (4) sulphide-gold mineralised horizons. A fifth separate surface was created for the saprolite as a hard boundary between fresh and oxidized mineralisation. Insufficient drilling data for the upper saprolite region is partly the reason for modelling a 3D surface (DTM or digital terrain model) as a distinct boundary between fresh and oxidized mineralisation. 75m along strike by 10m cross strike by 75m down dip search ellipse with restrictions of minimum two drill holes and minimum and maximum samples of 2 and 15, respectively. The resource was classified as an Inferred resource due to available drill hole density and distance between drill holes. The resource remains open in several directions. Additional in-fill drilling to a nominal spacing of 50 m between drill holes along strike as well as down-dip drilling may convert some or all of the existing Inferred Mineral Resource to an Indicated Mineral Resource. Coffey has informed Columbus Gold that in its opinion a major drilling program and budget is warranted to upgrade the resource in both fresh rock and the saprolite cover. An updated NI 43-101-compliant technical report on the resource estimate will be filed on SEDAR in due course after it is made available to Columbus Gold by Coffey, and Columbus Gold expects to file within the 45 day period required under NI 43-101. Mr. Robert J. Fraser, P.Geo., Qualified Person for the purpose of preparing the NI 43-101 Technical Report, and Mr. Hassan Waberi, P.Geo., Qualified Person for the resource estimation, have reviewed and approved the contents of this news release as far as it relates to their work. Columbus Gold is a gold exploration and development company operating in French Guiana. In French Guiana, Columbus Gold controls a 100% interest in the Paul Isnard gold project, which hosts a NI 43-101 compliant 5.37 million ounce Inferred gold resource with substantial expansion potential. In the United States, Columbus Gold holds approximately 25 properties located in the States of Nevada and Arizona. In December 2012, Columbus Gold and Columbus Silver Corporation (CSC: TSX-V) entered into an agreement under which Columbus Gold has granted to Columbus Silver an option to acquire its Bolo property located in Nevada, as well as 100% of Columbus Gold's other projects in the United States. Coffey Mining is part of Coffey International Limited, a publicly-traded consulting company listed on the Australian Stock Exchange. Coffey International Limited consists of a range of specialist companies working in geosciences, social infrastructure and physical infrastructure and operates in more than 60 countries around the world. Coffey Mining is an integrated Australian-based consulting firm, which has been providing services and advice to the international mineral industry and financial institutions since 1987. Coffey Mining, through Coffey Geotechnics Inc., established a presence in Toronto, Canada in 2009. This office now complements services provided in Australia, Africa and South America. This release contains forward-looking information and statements, as defined by law including without limitation Canadian securities laws and the "safe harbor" provisions of the US Private Securities Litigation Reform Act of 1995 ("forward-looking statements"), respecting drilling, and Columbus Gold's general exploration plans, including without limitation the possibility of a Phase II program at Montagne d'Or, the possibility of such program increasing the size of the resource located therein, and the possibility of such program upgrading some or all of the Inferred resource to an Indicated resource. Forward-looking statements involve risks, uncertainties and other factors that may cause actual results to be materially different from those expressed or implied by the forward-looking statements, including without limitation: the desire and ability of Columbus Gold to continue drilling; the ability of Columbus Gold to finance further exploration work, either through debt or equity, on a timely basis or at all; political risk; the ability to acquire necessary permits and other authorizations; environmental compliance; cost increases; availability of qualified workers and drill equipment; competition for mining properties; risks associated with exploration projects, mineral reserve and resource estimates (including the risk of assumption and methodology errors); the accuracy of Coffey's conclusions; dependence on third parties for services and results, including without limitation the dependence of Columbus Gold on the work completed by Coffey; non-performance by contractual counterparties; title risks; and general business and economic conditions. Forward-looking statements are based on a number of assumptions that may prove to be incorrect, including without limitation assumptions about: that the cost and design of the drill plan will be acceptable to Columbus Gold for the stated purposes; that the conclusions drawn by Coffey and reported herein are accurate; general business and economic conditions; the timing and receipt of required approvals; availability of financing; power prices; ability to procure equipment and supplies including without limitation drill rigs; that political risk will remain on current levels; and ongoing relations with employees, partners and joint venturers. Columbus Gold's actual results, performance, or achievement could differ materially from those expressed in, or implied by, these forward-looking statements, and readers are cautioned not to place undue reliance thereon. We can give no assurance that any of the events anticipated will transpire or occur, or if any of them do, what benefits we will derive from them. The forward-looking information contained in this document is expressly qualified by this cautionary statement. The foregoing factors and assumptions are not exhaustive and Columbus Gold undertakes no obligation to update any of the foregoing except as required by law. This news release includes certain estimates that comply with reporting standards in Canada, in particular with NI 43-101, a rule developed by the Canadian Securities Administrators to establish standards for public disclosure concerning mineral projects. These standards differ significantly from the requirements of the U.S. Securities and Exchange Commission (the "SEC"), and resource information contained herein may not be comparable to similar information disclosed by United States companies. Certain documents disclosed by Columbus Gold, including without limitation this news release, contain the term "inferred mineral resource" to comply with reporting standards in Canada. We advise United States investors that while this term is recognized and required by Canadian regulations, the SEC does not recognize it. United States investors are cautioned: (i) that the aforementioned term has a great amount of uncertainty as to its existence and as to its economic and legal feasibility; and (ii) not to assume that all or any part of the inferred resource exists. United States investors are urged to closely review the additional warnings and disclosure contained under the heading "Cautionary Note to United States Investors" in our Final Short Form Prospectus dated May 11, 2012, a copy of which may be obtained from Columbus Gold or downloaded from Columbus Gold's profile at www.SEDAR.com.